The 15th movie production of well known film producer Dr. Arosha Fernando - Eka Dawasaka Api is ready for screening with the successful completion of its post production work at the TVT studio. Directed by the award winning film director, Anuruddha Jayasinghe the main cast includes Pubudu Chathuranga and Nayanathara Wickramarachchi. The technical crew includes assistant director Sasika Herath, make up artiste Priyantha S. Wanninayake, DOP Chinthaka Somakeerthi, assistant make up artiste Yash Suwahas, art director Sanjeewa Karunaratne and the production equipment and crew is by Cinepro. 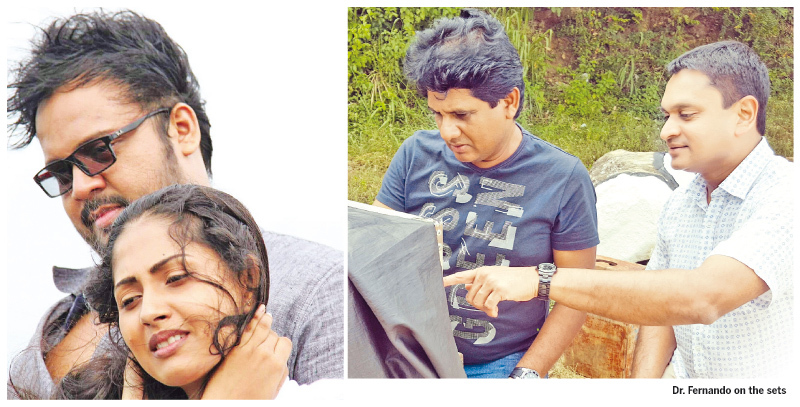 The film has been shot with much difficulties in tough terrains such as on top of the scenic Bible rock and many other unseen locations in Mahiyangana, Mawanella and the surrounding areas of Kandy and Peradeniya. ‘The team the latest technology including the drone to capture the incomparable scenic views which have not been captured in a movie before,” said Dr. Fernando. The movie is based on a true love story addressing a number of burning youth issues. It is scripted by director himself. The cast also includes seasoned artistes Veena Jayakody, Medha Jayaratne, Rohan Ranatunga and many more. Eka Dawasaka Api is presented by Universal Media Network Pvt Limited and is the maiden movie Production of Vinodaya, Sri Lanka’s number one Mobile Operator Dialog.